IN A DELICATE WOODEN frame, a photograph of Mary Sano with a mountain gorilla sits on her desk in the Palo Alto High School Social Sciences Department. Her love for animals led her to the no-longer-existing country of Zaire in central Africa, where she followed a guide step by step as she trekked through mountains to see an endangered gorilla species before it was too late. Zaire is just one of many places Sano has travelled to. Others include Greece, Japan, Singapore, New Zealand, Turkey, Australia and Thailand. Her adventures began after her sophomore year of college, when Sano dropped out of school. Though she later returned to finish school, this time gave her the chance to learn more about herself. Sano has been able to follow her passions throughout a lifetime of travel. 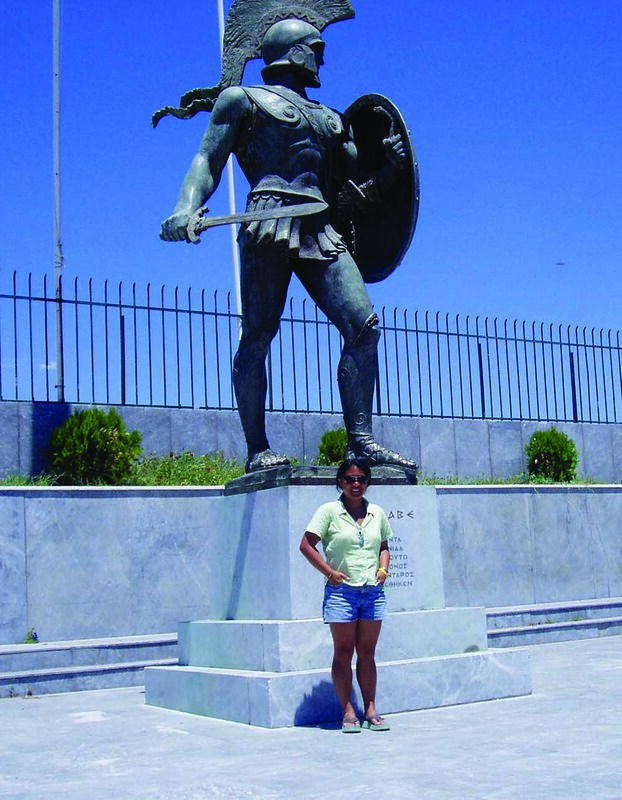 “My first academic love was classics—Greek literature and history—so that was my inspiration to go to Greece,” Sano says. After a year living in Athens and studying modern Greek, Sano felt at home and even considered gaining Greek citizenship. As a young adult travelling the world by herself, Sano says she felt fearless. “When you are at that stage of your life, you feel kind of invincible,” she says. Her determination led her not only to popular tourist destinations, but also to places less visited. “Syria was a very spur-of-the-moment thing, based off a photograph I saw,” Sano says. The photograph of an old, silk road city appeared in the travel section of the New York Times, and drove Sano to board a plane to in Damascus, Syria in 1997. Riding local buses, Sano travelled across the country to Homs, Hama, Palmyra and Aleppo, each one expanding her fascination for the culture. “I often think about the people we met and wonder if they have survived or maybe fled the country and are refugees,” Sano says. Formerly a Jordan Middle School ancient history teacher, Sano now teaches Contemporary World History. Throughout her teaching career, she continues to use stories to bring her travel experiences into the classroom to enhance students’ passion for history. Despite having travelled across oceans, Sano said she believes valuable lessons can be learned without going far.